Music for Memories – Alzheimer Services of the East Bayevent at PCA on Sat. 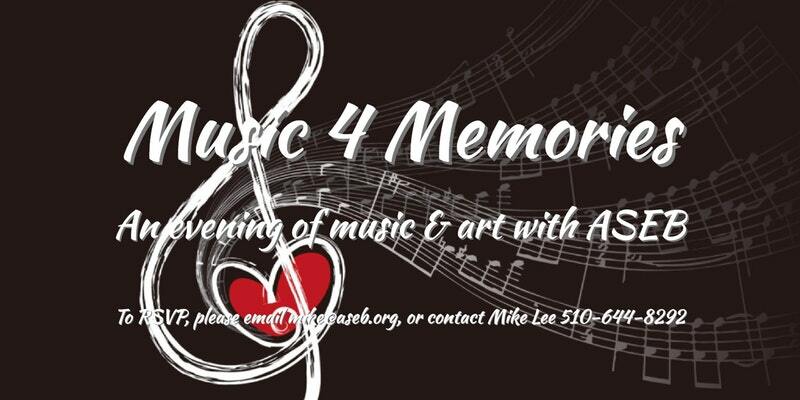 Alzheimer’s Services of the East Bay invites the community to its fall event, "Music for Memories", an evening of art and music this Saturday, November 11 from 6:00 to 9:00 p.m. at the Piedmont Center for the Arts. The event is a celebration of ASEB’s 29 years of service through partnering with communities, family and friends. Come and enjoy live music, food, drink, dancing, as well as a silent auction with wonderful items on which to bid. Tickets are $50 General Admission and $15 for students, and are available by contacting Mike Lee at Alzheimer's Services of the East Bay, tel. 644-8292 (mike@aseb.org).